Established in 2013, we are a family run business owned and operated by father-son team John and Jonathan. We are passionate car enthusiasts, not professional car salesmen, who love the challenge of locating and finding your dream car. We embrace integrity, morals, values, and hard work. There is no request too big or small and we will use all available resources to find exactly what you are looking for if not found on our lot. Thank you for your business and our team looks forward to working with you now and in the future. 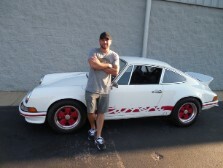 After a successful career in the enterprise software sales, I recently retired to pursue my real passion….CARS! From a early age, I have spend my free time finding, fixing, buying, trading, selling, and most of all enjoying cars. 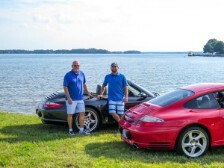 With Lake Norman Auto Exchange, I’ve taken my passion with cars and created a family business with my son to make the typically dreadful car buying process into an enjoyable stress free experience for my clients. Finding the perfect car for YOU versus selling what is on the lot. Personally, my passion is all about Porsches. I have been a Porsche Club of America member for 20+ years and long time collector. My latest project has been restoring a 1955 Porsche Speedster back to the original build sheet from Stuttgart! I look forward to the opportunity to share my passion with you in the future. Growing up in a car enthused family, I’ve always had an appreciation for automobiles. With the creation of Lake Norman Auto Exchange, I’ve had a great opportunity to sell my previous business up in the northeast and return home NC to pursue a career in the automotive industry with my father to share his passion. Some of my favorites include Porsches (specifically air-cooled pre-1997), Fast Fords (Lightning's and Mustangs), BMW (M series), and classic muscle cars. I look forward to helping make your car buying experience quick and pleasurable.